The other day I smiled when I saw a friend put a post on Facebook that included a Creative Commons attribution. He was the person who taught me how important it is, just from the perspective of respect, to get permission before posting another person’s work on your social media page. This was before I studied and fell in love with copyright. Now, it warms my little lawyer heart to see someone respecting copyright. And I finally have time to read Gary Vaynerchuk’s book Jab, Jab, Jab, Right Hook, which is filled with helpful information on how to market your business and excellent demonstrative case studies. One of his lessons is to use each platform to suit the needs to the users. So if a site is visually-focused, like Facebook or Pinterest, you want to create posts that have images that will provide users value and hopefully they’ll share them. His book has great examples of how companies are doing this effectively and what habits you shouldn’t emulate. This is when the red flag went up for me. If a company’s marketing department created a photo, there’s no problem with copyright. But if a company is using someone else’s photo (because companies don’t just have to talk about themselves online), they have to deal with the question of whether they have permission to use the image in question. A lot of companies appear to be thoughtful about making sure they are using their own photos or finding images via Creative Commons for their website or blog. However, they don’t apply the same standards to their social media posts. If you’re doing this, and pulling images from other site without getting permission from the copyright owner, you could be setting your company up to be accused of copyright infringement and face a cease and desist letter, a DMCA takedown notice, a bill, or possibly a lawsuit. I’ve been inspired by people who use social media effectively and find amazing images to incorporate into their posts. I hope to create more content on social media that’s worth sharing. If you’re in my boat, please make sure to use images you own or use Creative Commons. When I use Creative Commons, I only pull images that come with a license that let me modify (aka crop them) and commercialize them. And even on social media, give your photographer the attribution. You may be legally obligated to do it, and it’s also a sign of respect for their work. 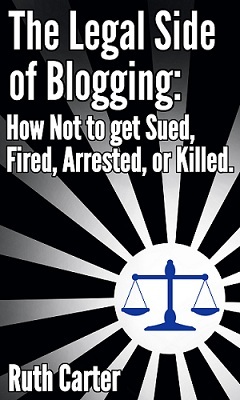 If you need an effective legal resource written in layman’s terms on this topic, I recommend my book, The Legal Side of Blogging: How Not to get Sued, Fired, Arrested, or Killed. It covers a lot of the major issues that apply to copyright and the internet. If you want to chat more about this topic, feel free to connect with me on Twitter, Facebook, YouTube, LinkedIn, or you can email me. The owner of a copyright has the exclusive right to control where their work is copied, displayed, and distributed. If they think that someone is using their work without permission, there’s a good chance they’re going to react. They may be passive aggressive and write a blog post about you. They might b direct and send you an email or call you. If they sell their work for a living, they may just send you a bill. They may also hire a lawyer to send a cease and desist letter, a DMCA takedown notice to your webhost, or they may just sue you. If you are accused of violating someone’s copyright, the first thing you want to do is examine the situation. What are they claiming is on your site or your materials that belongs to them? Some people will tell you that you can use anything you find on the internet as long as you provide and attribution and a link to the original – and that’s just not true. What you may have done is commit infringement and admit it. So look at the image or text in question and try to determine where it came from. If you created it from scratch, there’s a good chance it’s not infringement. If you got it from someone else, you may have a problem. In most cases, it’s a good idea to schedule an appointment with your copyright lawyer if you’re accused of committing infringement, especially if the other side contacted you through their lawyer. He/she can examine the situation, explain your options, and help you choose the right course of action for your situation. In most cases, the person who claims you stole their work doesn’t want to sue you. They likely want you to stop using their material, and possibly pay a licensing fee for the time you used it. In many cases you want to respond either as yourself or through your lawyer with what you did or could do to resolve the situation. There are times where you might want to risk not responding. Some people do this is they think nothing will happen if they ignore the notice from the person claiming you stole their work. Sometimes this is effective. Sometimes it leads the person to escalate and sue you or report your company to a regulatory body that oversees your company. It’s not a decision to make lightly. So what are the best and worse-case scenarios in these situations? In the best-case scenario, the person making the claim against you is wrong because you haven’t violated their copyright sending a response to that end or ignoring them will resolve the situation. In the worst-case scenario, you’ll be sued (and lose!) for willfully stealing someone’s copyright and sued for $150,000 per image or article you stole, plus the copyright holder’s attorney’s fees. Because the penalties can be so high, you want to be careful when you use other people’s content on your website or marketing materials. You need to be sure that you own or have permission to use content created by third parties. A few days ago, a friend and fellow author posted on Facebook that someone put his book online as a free download without his permission. Some authors make their work available for free as part of their marketing campaign and that’s their prerogative, and they control where and when they do this. My friend and I started chatting about what he wanted to do to remedy this situation. A person who owns a copyright has the right to control where their work is copied, displayed, and distributed and has recourse if someone else steals or uses their work. If someone blatantly copies your work and is giving away copies of it, it’s likely copyright infringement. I thought my friend could qualify to sue for copyright infringement and sue for statutory damages. The copyright laws say that if someone willfully steals your work, you can ask the court to award you up to $150,000 plus attorneys’ fees. Alternatively, you could ask for actual damages, which is how much money you actually lost due to the infringement. My friend is self-published in this case, so I suspected the potential statutory damages would be higher than the actual ones. Then my friend dropped a bomb – he hadn’t registered his copyright yet. My friend is a smart guy, so he knew that he couldn’t sue for copyright infringement until he registered his copyright. What he didn’t know what that you have to register your work within 3 months of publication or 1 month of learning of the infringement – whichever happens first – to be eligible for statutory damages. He can still register his work and sue for the actual damages (which is likely low) and he’d be responsible for paying for his attorneys’ fees. If he doesn’t want to put in the time, energy, or money to sue for infringement, he can still get is legal eagle friend (that’s me) to send a cease and desist letter or a DMCA takedown notice to try to make the infringement stop. So here’s the take-away lesson from my friend’s experience: If you are a self-published author, register your work with the U.S. Copyright Office before you offer it for sale or download. That way, if someone steals your work, all your options for recourse will still be available to you. You can register your work online and the application fee is only $ 35 or $55, depending on your situation. And if you don’t want to register your work yourself, it’s not that expensive to hire a lawyer to do it for you. If you want to talk more self-publishing and copyright, you can connected with me on Twitter, Facebook, YouTube, LinkedIn, or you can email me. You can also subscribe to the Carter Law Firm newsletter. I’m a member of a Facebook group for people to discuss and share instances where other people use their work. Most of the members are nature photographers who do gorgeous work. Most of them have no desire to sue people who steal their work, but they would like to be compensated. And some of them are getting pissed when they find that someone has stolen their work and have started sending bills to people who use their work without permission. This isn’t a bad idea. I’ve had a friend get a bill in the mail when he used someone’s photograph without permission that he found via Google Images. You can view it here or below. When someone comes to me and wants to send a bill to anyone they discover is infringing on their copyrights, I suggest they add information to the website where they show their work about licensing terms and fees. This makes it more credible when the artist sends a bill that essentially says that by using a photograph, the infringer has agreed to pay the fee and abide by the license’s terms. As long as the infringer complies, they are no longer committing copyright infringement. The downside of this strategy is many people will ignore such a bill if they receive one. Then the question for the artist is “What’s next?” Do you sue them? Send a DMCA takedown notice to get the work taken off their site? Call them out publicly for using your work without permission? Do you drop the issue? My friend who got the bill for using an authorized image earlier this year got a bill from a company with a track record of suing people who don’t pay the bill and winning. In his case, he choices appeared to be pay the bill (or try to negotiate a lower price) or get sued. If you don’t follow up when people don’t pay the bill, it’s kind of like the photo radar tickets. If you get one in the mail, you can deal with it by paying the fine or going to traffic school or avoid service for four months until the court drops the charge. I’m not one to tell people what they should do, but I advise people to think their plan of action all the way through before selecting a course of action. If you need help deciding what’s the best strategy for protecting your copyrights, please contact a copyright attorney in your community. For more information about copyright and blogs, please check out my book The Legal Side of Blogging: How Not to get Sued, Fired, Arrested, or Killed.